Rabbi Steve and Joyce Foster understand how to navigate the perilous waters of religion, politics and the public limelight while remaining true to their values, and one another. Their joint autobiography, an experiential narrative of their respective roles as Temple Emanuel’s longtime rabbi and as Denver city councilwoman and Colorado state senator, is a collaborative feast of things known and unknown. While the reader may be aware of some of the incidents put forth in the memoir, there are ample revelations of compassionate acts conducted behind the scenes. Rabbi Foster has been a prominent force in Denvers Jewish and interfaith communities during his 40-year tenure at the Reform temple. A veteran of the 1965 civil rights march in Selma, he’s tackled popular and unpopular issues like a tenacious quarterback. When he received death threats and was called out by the ADL for objecting to the yearly nativity scenes in front of the City and County Building (the courts sided with the churches), he charged ahead to the next issue. During the 1982 blizzard that paralyzed Denver, Father Woody (Catholic priest Charles Woodrich) reached out to the community for funds to help the homeless. Foster personally gave him a $5,000 check. After the Columbine massacre in 1999, the attorney representing the mother of one of the killers requested Steve Foster to visit the boys’ parents. He found a Jewish woman in mourning for her own son, while simultaneously anguishing over the innocent lives he stole. “I spoke to her as a rabbi, to a mother who just lost her son,” Foster recounts in the book. To me, that was what it was all about. 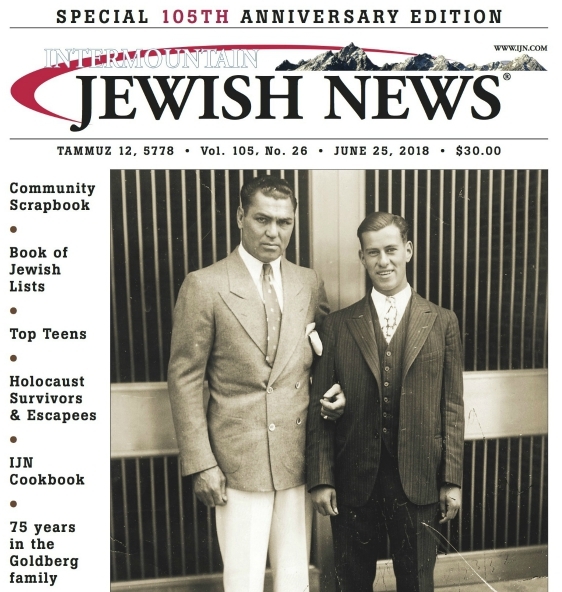 As rebbetzin of Temple Emanuel, Joyce Foster took her role quite seriously but rejected the ostensibly entitled congregational influence that can accompanies the title. Similar to her close friend and mentor Ida Goldberger, she chose to pursue and expanded her professional horizons. Fighting by her husband’s side for important causes, Joyce inevitably carved out her own path. She was serving on the JFS board when a part-time job opened up. What was supposed to be a temporary position evolved into a 16-year career as director of resource development and employment services. Raised a Democrat, as was Steve, Joyce was not a political animal. Causes were one thing; participating in the process was quite another. When her son David approached his mother about running for the Denver City Council seat in 1993, Joyce was flabbergasted. Soon Sen. Ken Gordon and political consultant Ken Smith added their strategic nudging. But she did have concerns for her district, like renovating the University Hills Shopping District, making improvements to a popular park and her support for the Light Rail. Joyce not only won the election, she became president of the council during her 10-year-term. If she didn’t have an answer, she turned to people who did. Strongly backed by the Jewish community, she obviously appealed to non-Jews. From 2008-2012, Joyce served as a Colorado State Senator. She won numerous legislative victories and also had one or two acrimonious, highly publicized setbacks. Joyce does not evade these difficult moments in the book, which commends her willingness to be fully human. This complex, engrossing and detailed glimpse of two separate lives that function as a single unit is above all a love story. Married on Dec. 26, 1965, the Fosters not only survived the usual challenges that beset marital couples, they earned success without sacrificing the ultimate prize  their family. Steve and Joyce, now officially retired, are the parents of David, Debbie and Danny and the doting grandparents of Lucy, Abby, Ozzie, Rex, Aiden and Bo. The entire mishpacha lives within walking distance of one another. What higher compliment than this? Congregants and friends of the Fosters will devour the book. Strangers peering in from the outside will read it cover to cover. This is a story about the journey of two individuals engaged in a mission to usher light into the world. Together, they are something this community has never seen before. The Rabbi and the Senator Sleep Together: Marrying Religion and Politics, with Cindy Brovsky (Triple D Press), is available at the Temple Emanuel and BMH-BJ gift shops, the Tattered Cover and www.therabbiandsenatorsleeptogether.com.